The latest anthology featuring one of my short stories has gone live on Amazon! 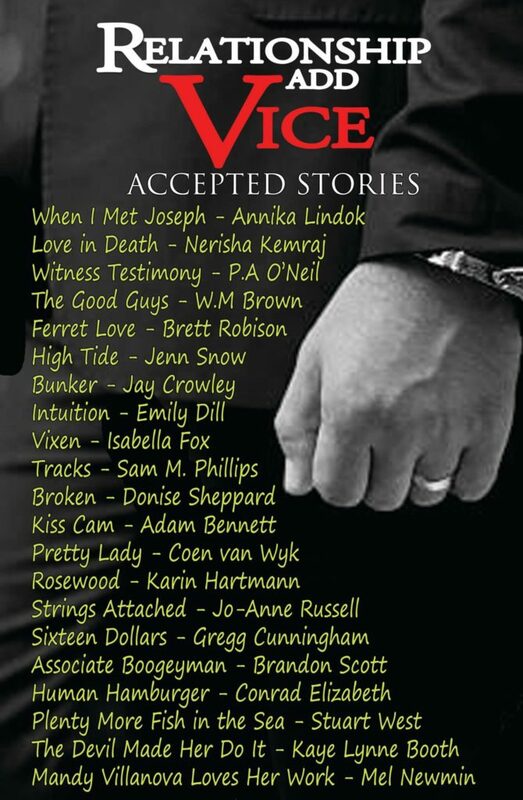 Relationship Add Vice, which includes my story “Intuition” in their 21-story list, can be bought off of Amazon now in Kindle or paperback format. My story is about a police officer who pulls a woman over for speeding, but is quickly won over by her energy and personality and begins to date her. However, a serial killer is loose in their town, and his police intuition keeps telling him that she’s not safe. If she won’t take his advice to protect herself, she could end up as the next victim. 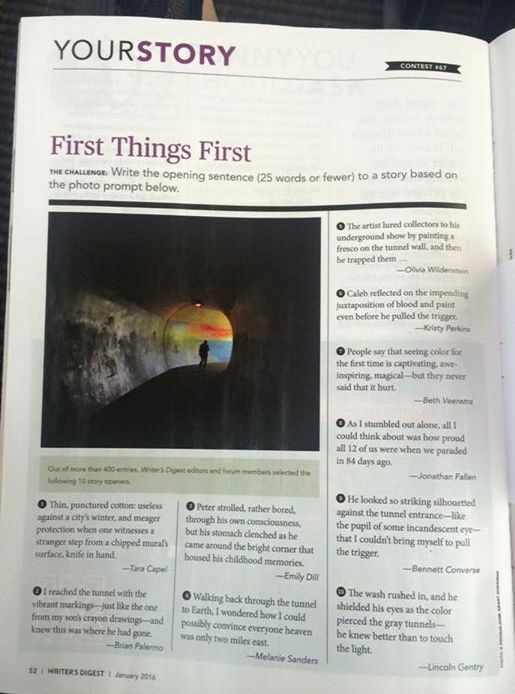 The editors mostly left my story in its original format. They added an opening line I didn’t write and a closing line I didn’t write, but everything in between is mine and I’m pretty happy with it. Please let me know what you think if you get a chance to read it! 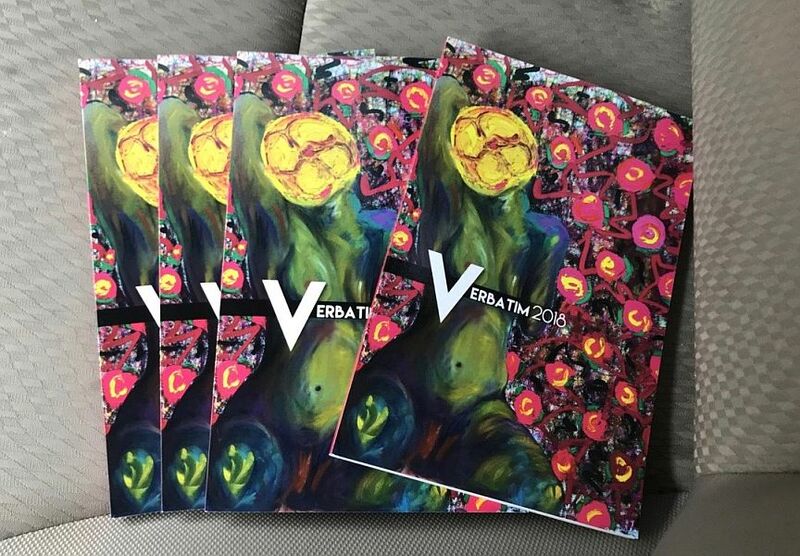 I also have a story coming out in my local library’s new writing journal, Verbatim. I’m not sure if this journal will be available for purchase online or only in person, but I’ll let you know when I know. 🙂 The story is called “Shadow”; it’s a flash fiction piece and is a throwback to old villages being haunted by older spirits. I’ve also written another longer story along those lines that I’ll be shopping around in the coming months and hope to have in a collection soon! I have another short story coming to you guys! 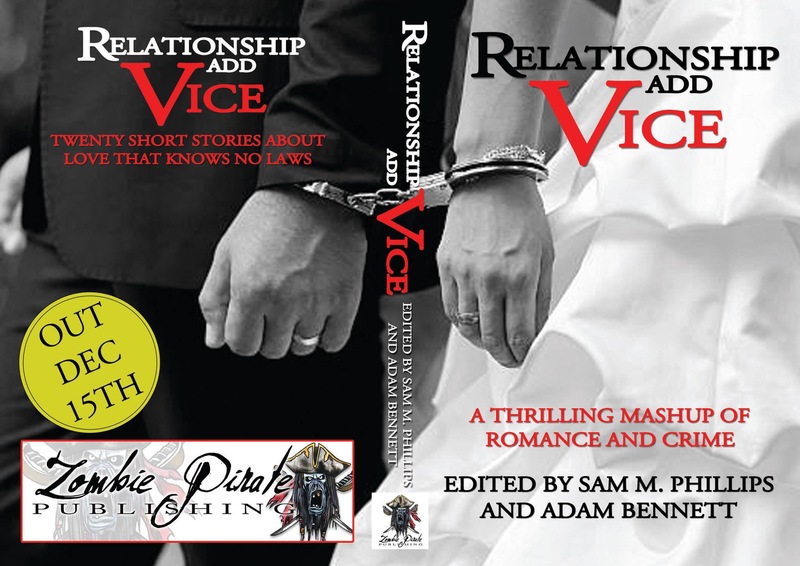 My story Intuition will appear in “Relationship Add Vice“, a collection of stories where “crime meets romance”. The collection will release December 15th, and comes to us from Zombie Pirate Publishing, which I’m sure we can all agree is a fantabulous name. Click here to pre-order the ebook. I’ll keep you guys posted on any more news, and make sure to let me know what you think of the story once you’ve read it. 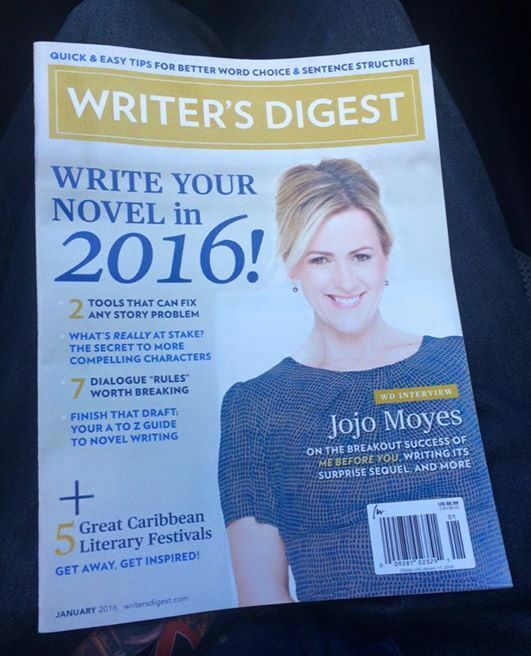 And don’t forget, you can still buy the first anthology to feature one of my short stories. 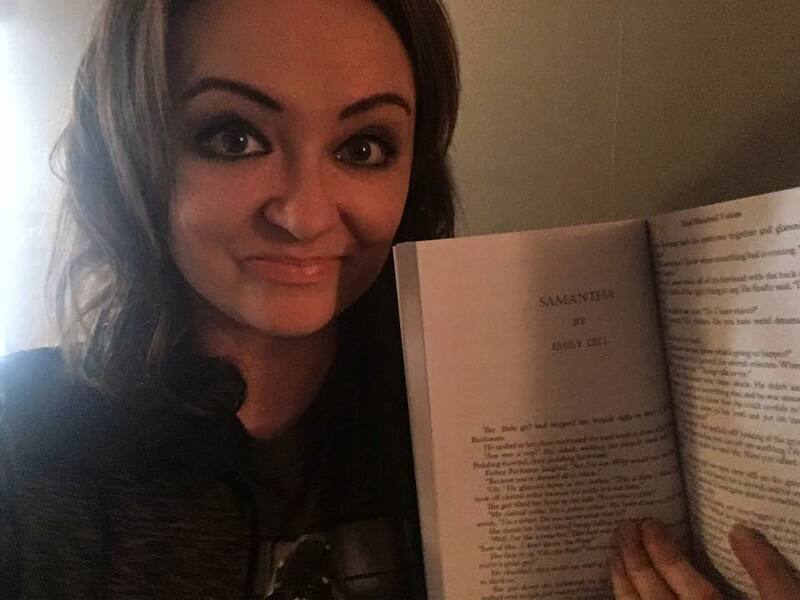 Click here to buy 100 Voices: Volume Too to read my story Samantha. 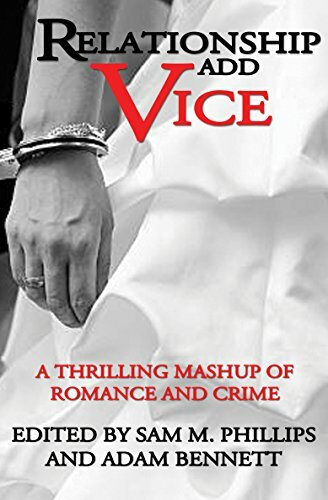 Use the code 100V2V83 in the box provided to get a 10% author discount. Click here to buy directly from the publisher – use the code 100V2V83 to get a 10% discount. 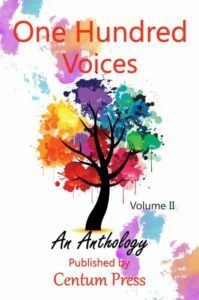 You can also search “100 Voices: Volume Two” on Amazon, Books A Million, or Barnes & Noble and buy online from their marketplaces. Have a wonderful week, and remember – it’s always a great day to have a great day. A cacophony of shadows, and all I feel is fear. Our village lives in terror of the Night Shadow, the supernatural being who supposedly decides which townspeople live and die. As a means of warding off death, the village chooses one young woman a year to give to the Shadow in marriage. They always make the sacrifice during a full moon in March. I’ve known since I was old enough to understand the stories that my name would eventually be called, and yesterday it was. Tonight I stand in the middle of a forest, with my arms tied to a rope wrapped around the tree. This is where the villagers leave the girl every year. In the morning, when they come back, the rope is always cut, and the young woman is always gone. None have ever returned. I don’t know what happens to them – no one does – but we all assume the same thing: The Night Shadow accepts the village’s sacrifice and kills the girl. Through the treetops, I see clouds moving to cover the full moon. Instinctively, I know I’ll see the Shadow soon. I hear no noises; shadows are always silent. But a change in air pressure assures me that he’s close. I spent all of last night awake, wondering what I would say to him and how I could best plead for my life. But now that the moment is here, all I know is that I won’t die whimpering or begging, as the previous girls assuredly did. “Hello, husband,” I say, trying to sound amused. The breeze pushes my hair into my face, and I blow it away. “I was beginning to wonder if you’d had a change of heart. Cold feet and all that.” I focus on a tree a few feet away, looking for the shadow in my peripheral vision without being obvious. I think I hear the slightest laugh, but it could be branches moving. I feel something brush my neck, and tell myself it’s the wind. I feel him behind me, and I notice the moon has now cast a second shadow on the ground by mine. I shiver when he speaks. I should. I know I should. But I don’t. “Do it,” he presses on. I listen for a response, eyes still closed. I feel a release of tension in my wrists. The rope has been cut. “Will you beg?” he asks one last time, mouth inches away. “I will not.” I don’t look at him. “Maybe next year,” he breathes. I’ll be here when the villagers return in the morning. Hey, you. And you. And even you. I’ve gotten behind on some of my Writing Wednesdays, so I’ve decided to aim for every other Wednesday. 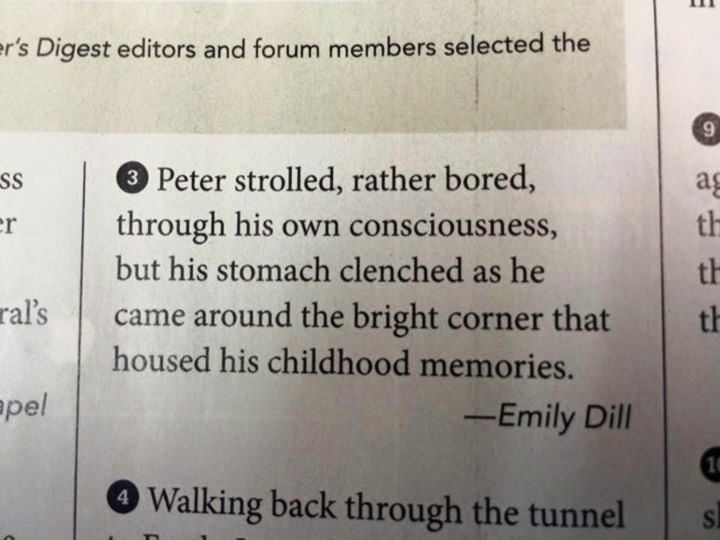 (Set the bar low, friends.) I’ll talk a little bit in these posts about where I am in my writing, maybe share some excerpts, or give you some tips I’ve picked up on. Elizabeth Harding contacts the crew of cable TV’s smash hit ghost-hunting show, Seeking Sprits. She has a major problem with her new house – it seems to be haunted by a jealous, territorial male spirit who won’t let her entertain any male guests. The crew heads to her house to shoot an episode, expecting to hear maybe a few bumps in the night and see a shadow or two. What they don’t expect is to be locked in overnight with an angry, vengeful spirit who doesn’t like even one male visitor, let alone four. The television crew had finally arrived.Elizabeth had been nervously fluffing couch pillows when she heard their van doors slamming from outside. She peeked through her living room blinds and saw the huge van sitting in her driveway. She watched four men pile out of the vehicle, stretch, laugh, and push each other around, then open the back of the van to start unloading equipment. Elizabeth closed her eyes, took a deep breath, and opened her front door, letting the four men into her house, and into what had recently become her nightmare. Make sure to follow me on social media for updates about when my story will be available for purchase! I’m also in the process of working on two other short stories (one is supernatural, the other is about a psychotic truck stop waitress), and those will be available on Amazon as well, although I haven’t decided if they’ll be sold separately or as part of a short story collection. Exciting stuff! She rests by day in a frame. Four walls and four corners. From 10-6, every day, she is stillness itself. Everyone eventually leaves, but she sits for another hour, just to be sure. Finally, when darkness falls and street lights glow, she knows it’s safe. She leaves her perch and roams all night. Her favorites are the landscapes. She walks sunny trails and snowy hillsides, smells roses and wishes upon stars. She stares at bowls of fruit in the still life section, waiting for something to move. It doesn’t. Colors surround her in the abstract room. She doesn’t know what any of it means but it makes her pulse race. The black and white photography always makes her sad, although she doesn’t know why. The pictures of soldiers make her miss someone. As the sun rises in the real world, she rushes through self-portraits to return to her perch. And by the time the gallery opens, she is a painting. Then she’ll be free once more.